The purpose of this document is to help with the installation of FIM 2010 R2. Yes, this is a companion document to the actual installation guide. My focus here, is the FIM Portal. *NOTE: For the purpose of this wiki document, I am installing the FIM 2010 R2 Portal, Password Reset Portal and Password Reset Registration on this machine. This machine is a clean Windows Server 2008 R2 server. I want to ensure that I cover all of the prerequisites needed to execute the installation. It is not necessary, but as a recommendation it would be good to create the necessary accounts prior to executing the installation. For more information on the accounts to create, review FIM 2010 Installation Companion - Accounts. 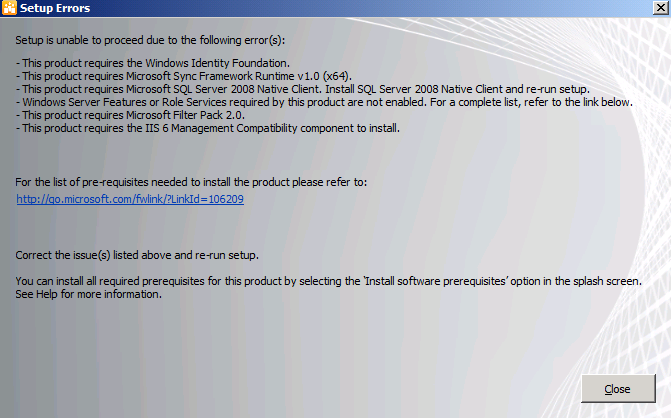 IIS is required to run SharePoint. On a Windows Server 2008 or Windows Server 2008 R2 server, IIS is a Role. You can install IIS via Server Manager > Roles > Add Roles. I am starting out, just installing the defaults for IIS so I can see everything that is required for me during this installation. In FIM 2010 R2 we can use either WSS 3.0 SP1 or SFS 2010 for the FIM Portal. *NOTE: Microsoft Office SharePoint Services (MOSS) is not a supported SharePoint Platform for the FIM Portal. The primary reason for this, is that MOSS ships with the User Profile Synchronization Service. This has a FIM Synchronization Service backend. 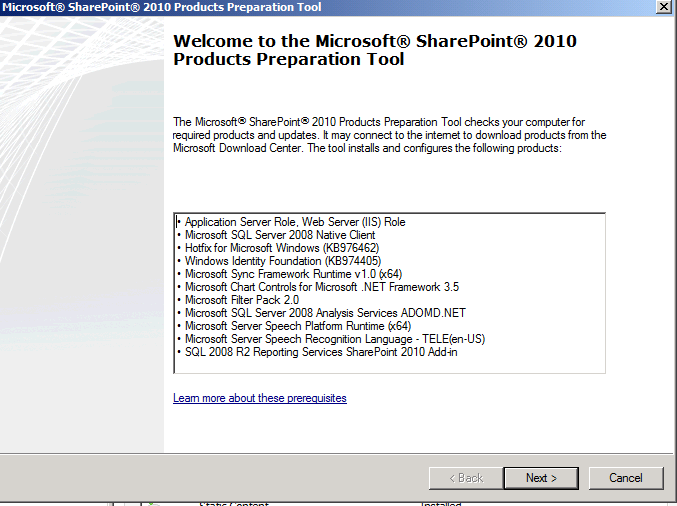 For the purpose of this wiki development I am installing SharePoint Foundation Server 2010. In doing so on my clean Windows Server 2008 R2 server, I noticed that I need the following components installed prior to installing SFS 2010. Once the Configuration Wizard is comlete, check to ensure that the SharePoint 2010 Administration Service is started. During the installation of the FIM Portal, FIM Password Registration Portal, and the FIM PasswordSet Portal we check to see if the SharePoint 2010 Service is started. If it is not started, then the installation will be stopped ( paused ) requesting you to start the SharePoint 2010 Administration Service and then retry. First, if you are logged on as yourself, it is recommended that you install with a different account. The FIM 2010 Installation Companion - Accounts recommends a FIM Install Account. You can do that, or have just an installation account that handles installations, because installations may require different permissions than standard use. If you are installing on a Windows Server 2008 R2 Server, and want to install via the Setup.Exe then I would recommend executing the installation by right clicking on Setup.Exe and selecting Run As Administrator. If the installation fails, then you will have the windows installer verbose log from the failed install.